Stream your favorite soundtrack from any compatible device with control available from the stereo or connected device. Enables direct stereo control from a compatible Multi-Function Display (MFD) or MS-NRX200i wired remote control when utilizing an existing NMEA 2000 network. 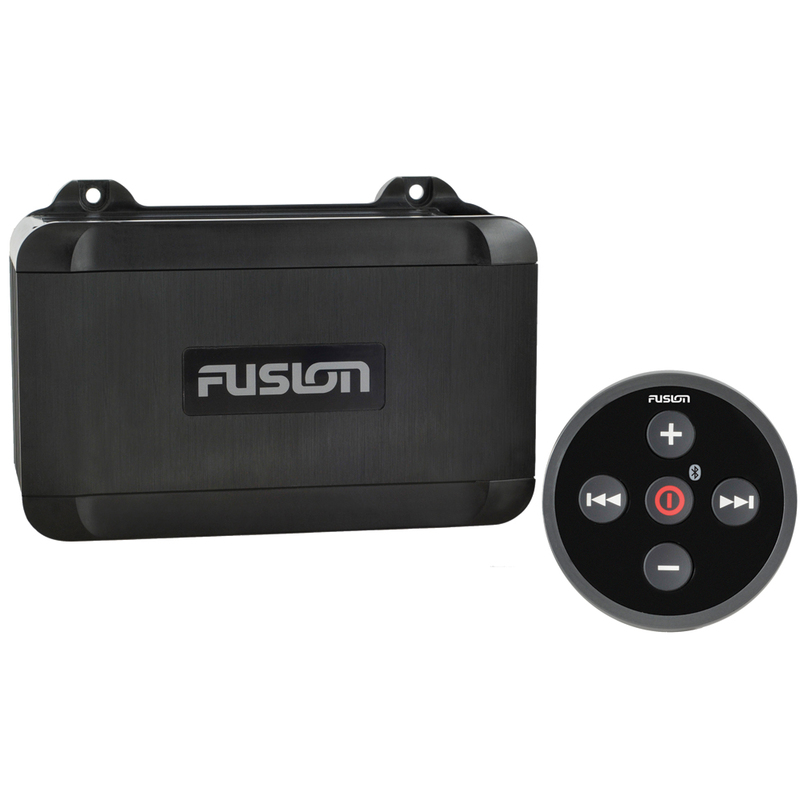 Download the FREE Apple® or Android™ FUSION-Link remote control app for Bluetooth from iTunes™ or Google Play™ and enjoy the freedom of wireless control. Two independent audio zones are available, each with advanced localized menu controls, including zone naming. USB connector on Black Box is provided to support charging and audio playback of any compatible device. Simply secure, plug and play for effortless entertainment. Included with the MS-BB100 Sound Core is an easy touch IPX7 waterproof remote, with embedded Bluetooth for optimum reception and quick audio adjustments. The embedded Bluetooth module in the core remote, delivers an easy mount solution to ensure clear Bluetooth audio streaming from your favorite devices. Ensuring smart, simple, streaming on board your vessel. Play music from the latest supported Apple devices seamlessly on the water. Amplifier components are optimally configured for heat sink integration and enhanced thermal transfer. FUSION Vertical Convection Technology (VCT) allows circulation of airflow around the heat sink edges for enhanced cooling.